Stakeholder analysis (also called stakeholder mapping) is an important step in designing a new program. Stakeholders include individuals, community leaders, groups and other organisations who will be impacted by the program, or who could influence the outcome. They can be internal or external. 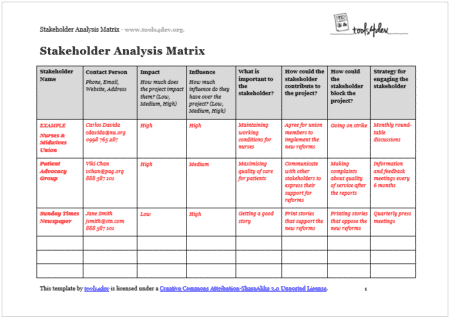 This template can be used to identify the stakeholders for a project, including their level of influence, which issues are important to them and how they will be engaged. The results of stakeholder mapping can also be displayed visually, using online tools such as GroupMap or the MindTools screen app. You want to identify the stakeholders for a program or project. You want to group stakeholders by their level of influence, what is important to them, and/or what they could contribute. You want to describe how you will engage stakeholders. You have a very large number of stakeholders (e.g. members in an association). In this case you may need a database to manage their details. You want to create a visual representation of your stakeholders. In this case use tools such as GroupMap or the MindTools screen app. 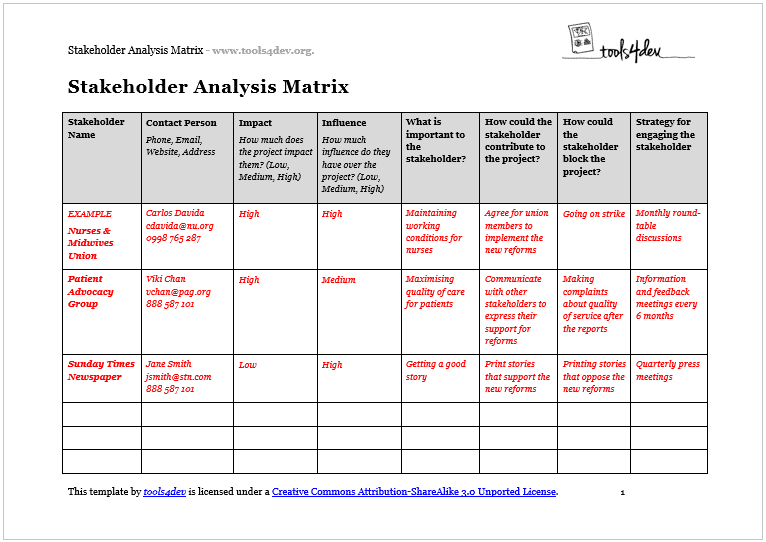 The Stakeholder Analysis Matrix Template by tools4dev is licensed under a Creative Commons Attribution-ShareAlike 3.0 Unported License. All other content is © tools4dev.